I’m really intrigued by IoT devices like the Amazon Echo or, most recently, Google Home from this year’s Google I/O. The idea of talking to a device and saying, “Play my morning playlist in the kitchen!” would be a nerd’s dream come true for me. But since I live in Germany, I’ve just given up hope being able to buy one of those devices in the near future (or waiting for Apple to make something comparable). I’ve got all those Sonos speakers scattered around the house and, even though not officially supported, there are ways to access the controller’s API. So let’s get our hands dirty and build our own Echo/Home device for controlling Sonos with our voice. Since this will certainly be a bigger project, I’ll be spreading the tutorial across different blogs posts. I recently got this new Raspberry Pi (RPI) 3 Model B with certainly the most awesome case available. So let’s load it up with some container goodness. The best and easiest option for running Docker on your RPI might be HypriotOS, which is just a minimal Debian-based OS optimized for and loaded with a recent version of Docker. You can download ready-to-use images to flash onto your RPI’s SD card right from their website. Just follow their “Getting Started” guide and you should be good to go within minutes. If you don’t know Kubernetes at all, just think of it as a managed Environment for running containers. Containers are running in Kubernetes pods and can be accessed via Kubernetes services. If containers crash or go down, Kubernetes will try its best to bring them back up automatically. For more, please refer to the official Kubernetes docs. Installing all components for bootstrapping a single node Kubernetes cluster can be a bit tedious. Luckily, there is the k8s-on-rpi repo on Github, which makes it a one liner in your terminal. Well, almost. I had to make a few adjustments to make it work on my RPI 3 Model B with Docker 1.10, which I’ll be using in the following steps. This will download a bunch of Docker images with all necessary components for running a Kubernetes master node on your RPI. It will also install some system services that’ll bring the node with all its pods and services back up automatically after a reboot. Yay, we just made our RPI a fully fledged Kubernetes node. Now that we have all pieces in place, let’s get to the real stuff: Although Sonos does not offer an official API, behind the curtains, it’s just good ol’ SOAP. So, it’s not that hard to reverse engineer it. In fact, some people already did. Big Kudos to them! 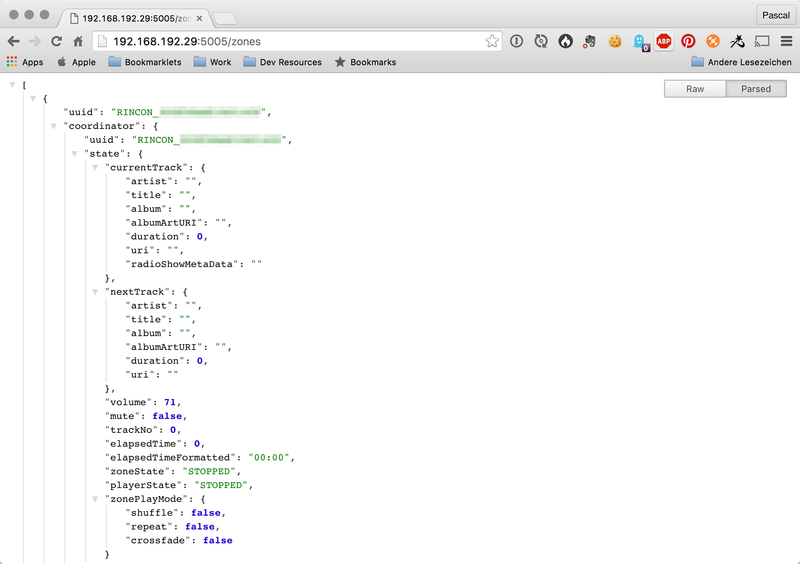 Last week, I stubled across the awesome node-sonos-http-api repository, which offers a pretty extensive HTTP API for controlling the Sonos system on your local network. It even includes a Dockerfile for running the API inside a Docker container. Of course, we cannot just use it as-is, because our RPI is powered by ARM and we need at least some custom base images built for ARM. Luckily the Hypriot guys thought about that too. λ docker build -t sonos-http-api . Take note of the --net=host flag, which basically means to not containerize the container’s networking, which, in this case, is necessary for the API to find the Sonos system on the same local network as your RPI. If everything is working as expected, you should be able to curl http://localhost:5005/zones from your RPI and receive a valid response, listing all your Sonos devices on the network. If you’re familiar with Kubernetes, this is mostly just your common boilerplate for creating a pod. If you’re new to Kubernetes, just ignore the metadata section for now. The interesting part is the spec section, which basically is just the docker run command from above “translated” to Kubernetes’ config format with an additional check called readinessProbe. This probe will notify the system when the container inside the pod is ready to respond to requests on TCP port 5005. So let’s review what we did today: We took a “vanilla” RPI and transformed it into a single node Kubernetes cluster running a fully-fledged HTTP API to access and control the Sonos speakers on our local network. Not that bad for a start. Next time, we’ll expand our Kubernetes setup and bring Nginx into the mix to secure our API for access outside our local network.